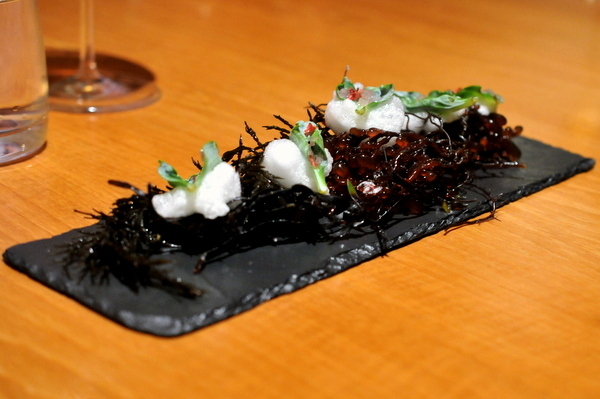 After visiting Atelier Crenn in 2011, I predicted the restaurant would claim 2 Michelin stars and though it took a year longer than I expected, Crenn earned its second etoile in the 2013 San Francisco Michelin Guide. In the two years since my last visit Dominique has upped her game, with the Chef's Grand Tasting Menu expanding from seven courses to twelve. Atelier Crenn was one of my best meals of the year during 2011 so I felt compelled to revisit it during my annual trip to the Bay Area. The meal kicked off with the restaurant's signature welcoming cocktail. Named for Crenn's hometown of Brittany, the traditional Kir Breton features créme de cassis and cider instead of white wine found in the basic Kir. 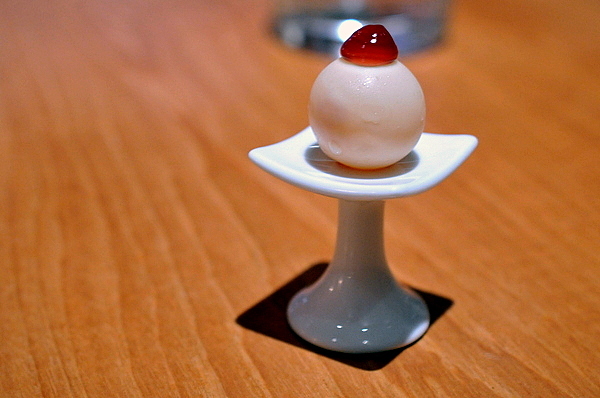 The cocktail comes wrapped in a delicate shell of white chocolate. After biting through the delicate morsel the palate is flooded with a rush of tangy fresh liquid with a creamy finish thanks to the melting white chocolate. 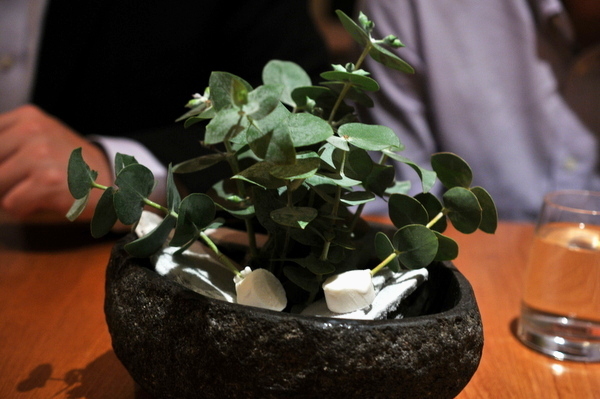 Our first course started with a single oyster leaf to prime the palate. 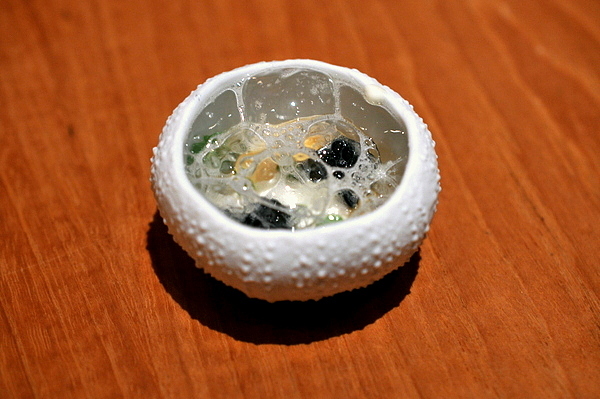 The leaf was followed up with a ceramic sea urchin shell filled with uni torchon, caviar, and licorice bubbles. I would have liked the torchon to be a bit creamier, but that small fault aside the dish was sublimely rich and decadent accented by the briny emphasis of the caviar. The licorice is properly subdued but adds a nuanced herbal sweetness to temper the multifaceted brine of the duet of roe. 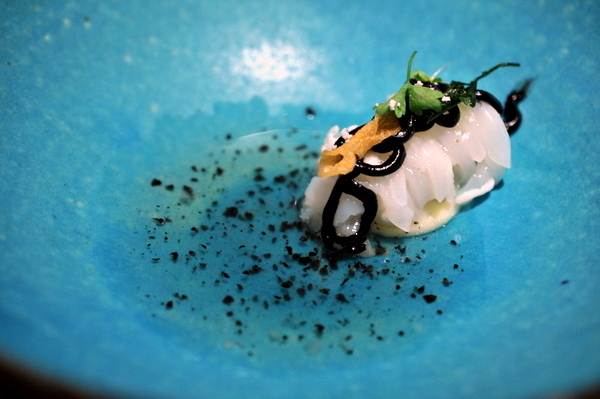 The toothsome mixture of supple squid "noodles" threaded with tender lardo was one of my favorite courses of the night. In addition to a fantastic textural interplay the combination of clean saline and musky fat is explosively rich and savory, if a bit too salty. The black truffle dashi adds a phenomenally luxurious earthy perfume to the mix making this one of my favorite courses of the evening. 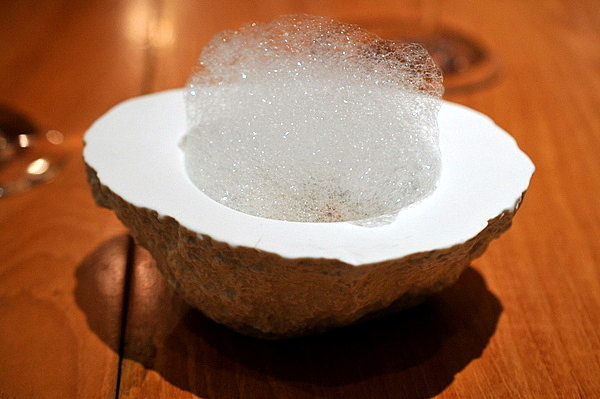 Another contender for the night's best course, the cratered bowl topped with tomato oil foam may not look like much but underneath the bubbles lurked a fantastic mixture of shellfish, fat, and offal. 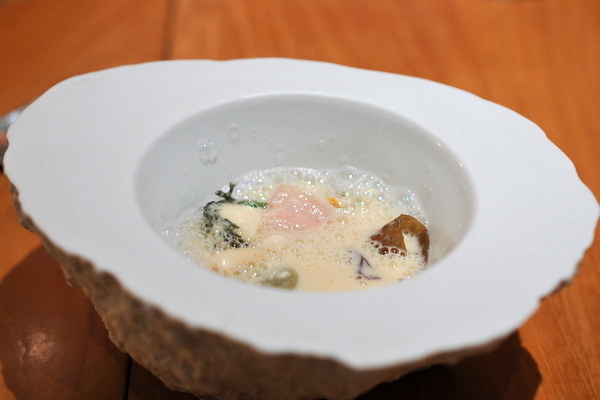 The broth's attack has a more aggressive ocean-y character thanks to the mixture of Razor and Manilla clams while the beautifully rendered pork belly and super saturated sweetbread give the soup a bisque-like body and richness. The Failla was an apt pairing for the broth, intense mineral and apple are balanced with cream and buttered toast; a natural partner for the shellfish. Here we have the restaurant's take on French Onion Soup. A single dumpling of Comte cheese and a slice of apple cider vinegar. came resting in a bowl on top of which was poured a smoky sweet onion soup The soup came with a small roll that tasted especially rich and sweet when eaten with the broth. The combination does indeed effectively recreate a French Onion soup but the dish felt a little simple for a restaurant of Crenn's caliber. Following the soup we were presented with a midmeal palate cleanser. 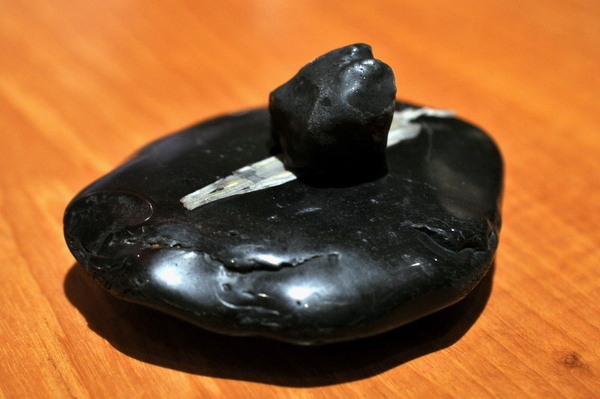 Like the Kir Breton, this course involved a thin shell filled with liquid but this time the shell was made of black licorice and shaped like a stone. Biting through the "stone" releases a crisp and tart liquid tinged with subdued herbal notes of coupled with the tangy levity of rhubarb. Beneath the stone was a sliver of fennel dehydrated into a wafer. 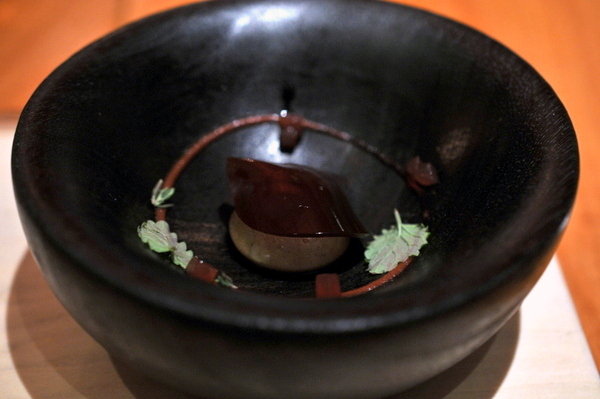 The "wood" element of the dish had a candied chewiness and corresponding sweetness that was quite enjoyable. 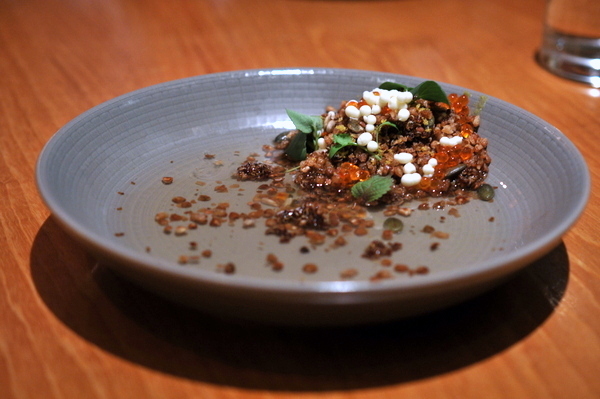 I never would have expected that my favorite course of the meal would be one where the key ingredients were grains and seeds. Made from a mixture of flax, pumpkin, sunflower and quinoa, the grains have been smoked roasted and fried giving them a complex mix of malty aromatics and a deep woody heartiness. A broth of dashi highlights the savory notes while the sturgeon cream and salmon eggs add a contrasting chill to the grains. Occasional flashes of yuzu kocho add a fruity highlight to the dish that my friend jokingly referred to as savory Grape Nuts. For me this was the only real misstep of the night. The tartar lacked the rich savor I would have expected from raw Wagyu beef and instead tasted faintly of egg and a faintly cloying mustiness either from the broccoli or the fermentation on the beef. The accompanying scallion salad was the one bright spot of the dish, crisp and succulent with the intense zest of fresh onion and viscous creamy egg yolks for contrast. I was glad to see that Dominique's signature dish is still going strong. Built around a mix of multiple species and preparations of mushrooms, the "woods" are at times firm and supple and at others dense and soft. 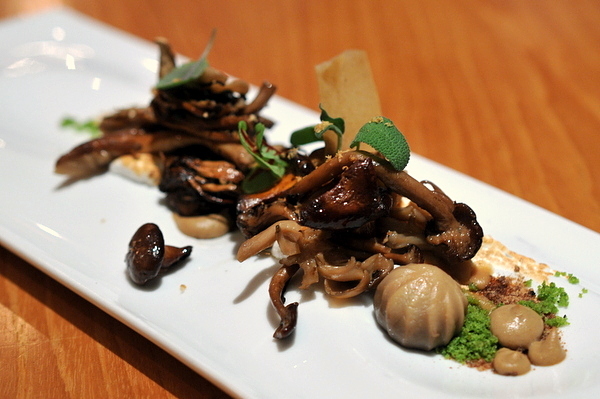 Likewise the mushrooms run the gamut from savory to earthy to piquant but it is the addition of torched meringue that brings the woods to life; the fresh green levity of pine completing the illusion of being in a forest. 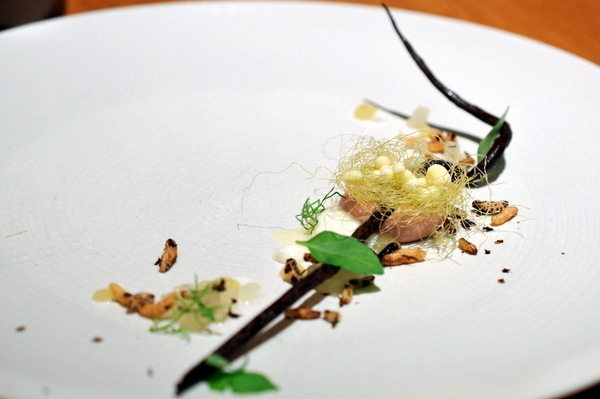 The nest of corn silk and dark chocolate branch made this the most visually striking dish in a night filled with beautiful presentations. Underneath the corn silk was a bed of what looked like foie gras but lacked the overt richness leading me to believe it was a pate of regular duck liver. The offal-y twang of the pate was deftly offset by the corn "eggs" as well as the creamy richness of the dark chocolate which sheds some of its natural bitterness when taken with the duck. 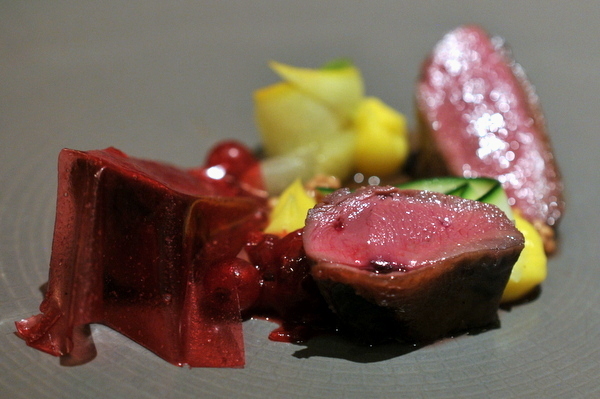 The final meat course of the night consisted of a beautifully cooked squab. 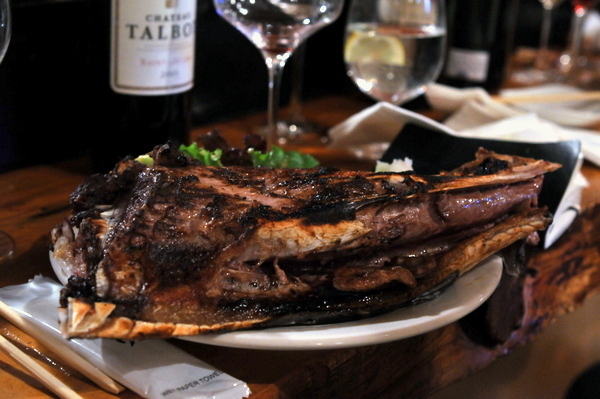 The bird is lithe with a pleasing oily slickness as well as a deep game-laced savor. The bright tang of the red currant and tart bite of the mustard were crucial in balancing the squab's weight while the squash provided a more neutral medium to even out the intensity of the other flavors on the plate. The Mourvedre blend that accompanied the squab was a lovely mix of bright raspberry with distinct notes of underbrush and herbs along with firm tannic structure. Officially the final savory, this dainty looking salad packed plenty of flavor into a very small package. The herbaceous mix of greens and flowers is tempered by the creamy savor of the vinagrette as well as the base of sugary meringue. 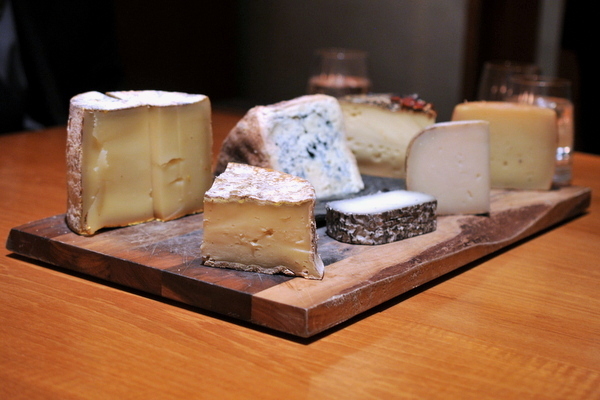 We opted to try all seven cheeses on offer. 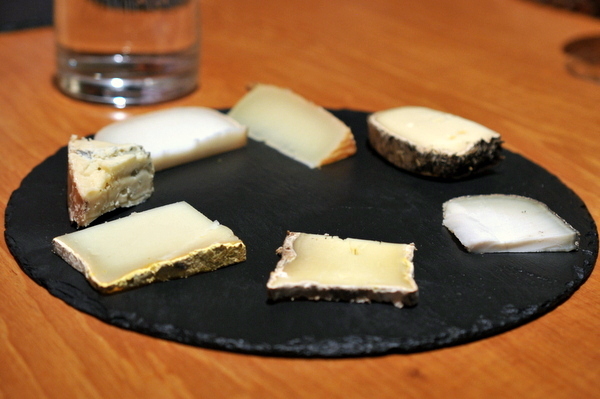 Though I didn't get all the names, the cheeses were all fairly approachable with the Bleu d'Auvergne being the most pungent. 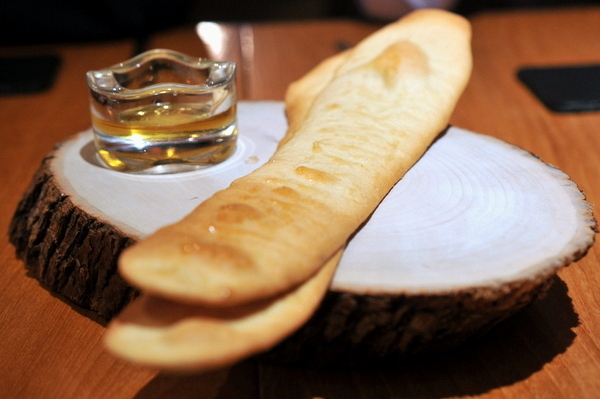 The cheeses came with a spread of honey and fried chickpea bread that was quite enjoyable even on its own. We were told to start with the sugarcane first which was cool with a light tang of lemongrass to compliment the sweetness. The guava juice shot had a ripe sweetness with bursts of acid from embedded bits of finger lime and an overarching freshness from the shiso leaf. 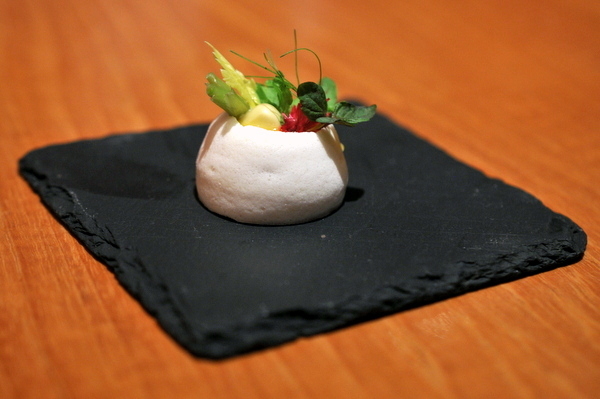 Another pre-dessert, that has been on the menu since the restaurant opened, is the Eucalyptus sorbet. Vividly aromatic and refreshing, the menthol-driven herbaceousness of the eucalyptus is balanced by the cool creamy sweetness of the sorbet. 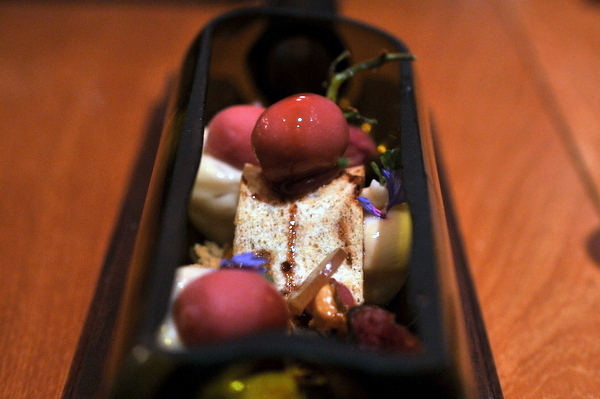 The olive dessert from my previous visit remains my favorite dessert of all time. Naturally I was hoping for something equally spectacular this time around so when we were presented with laser cut wine glasses it was all I could do to hold myself back and let our server explain the dish and pour a small vial of saba over the dessert. Along with various grape presentations, the dessert also featured hazelnut ice cream and a baguette dotted with raisins. The combination was sweet and nutty with a strong vinous and medicinal notes; a very cerebral study in all facets of grape. Ultimately the dessert tasted like a gentrified PB&J and while tasty, lacked the mystery and cohesive amplitude of the olives. 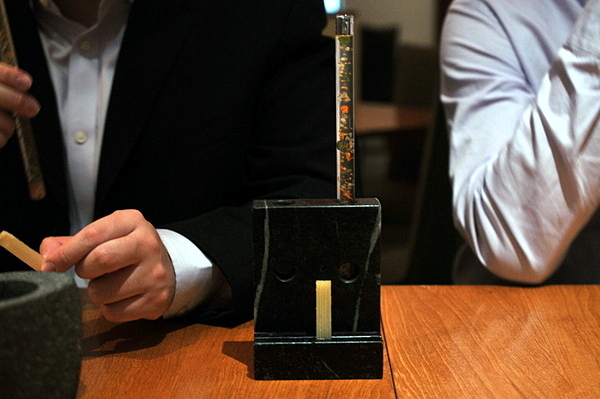 Atelier Crenn certainly doesn't skimp when it comes to their mignardises presentation. 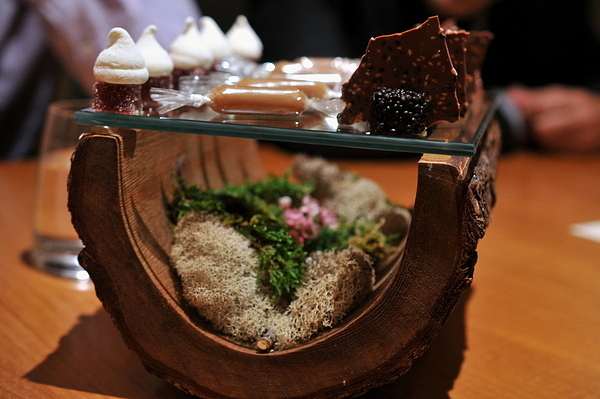 Two years ago they were served around a live Douglas Fir Bonsai and the current presentation features a hollowed out log filled with various aromatic plants. The desserts themselves were equally impressive from the jammy bite of the strawberry and pink peppercorn pate de fruit to the absolutely stunning chocolate ganache studded with coffee crisps. 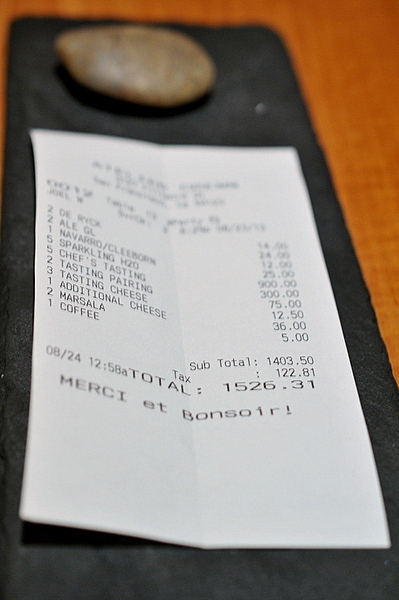 I immediately fell in love with Atelier Crenn after my first visit, naming it my favorite restaurant in the city. 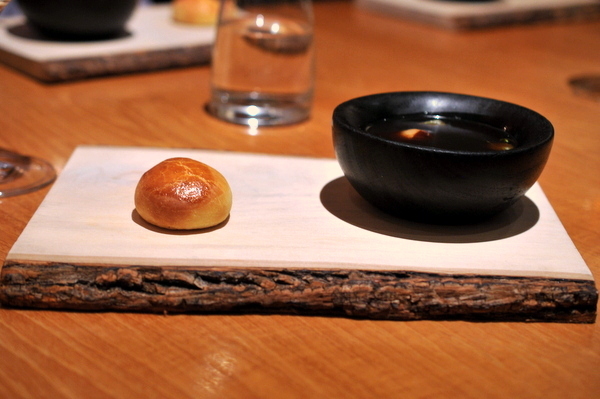 Two years on, the food has the same elegance and finesse from before but feels even more sophisticated and polished. In terms of food I think the restaurant is on the cusp of a third star though the supporting elements in the wine pairing and service need a bit more work. That isn't to say either was bad but the wine pairings didn't resonate with the food the way a truly great selection does. Likewise the service is attentive but lacks that sense of gravitas and martial precision that typifies 3-star service. Nitpicking aside, Atellier Crenn remains a superb dining experience and easily my best meal of the year. 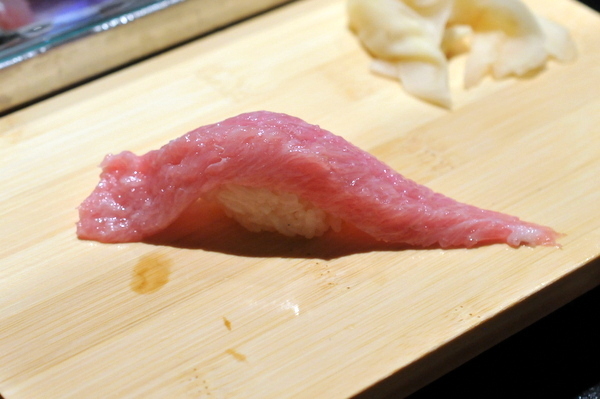 My early experiences have given me a healthy dose of skepticism when it comes to Korean or Chinese run sushi restaurants, but after reading about the luxurious omakase at unfortunately named Ootoro Sushi I was forced to reconsider. 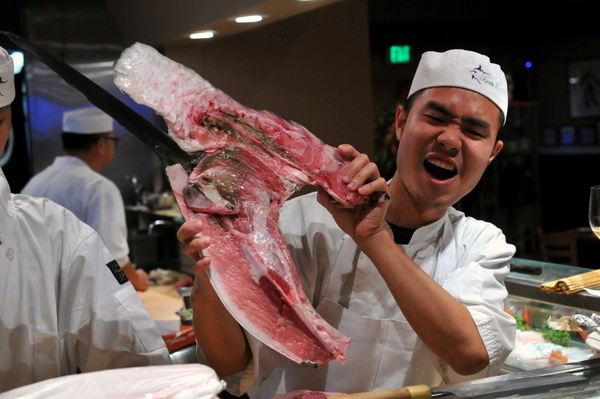 So when a friend invited me to a special dinner at Opus Sushi I was a bit wary, but the promise of Wagyu beef and Kama Toro was enough to overcome any lingering reservations. Naturally we sat at the bar where we were served by Ken, the young chef and co-owner of Opus. Gregarious and quick with a smile, his demeanor made us feel right at home. Taking advantage of the liberal BYOB policy and $12 corkage we broke out a fair amount of wine with dinner. First up was a Chablis from Pattes Loup clear notes of slate and salinity are nicely integrated with a rush of lemony fruit. 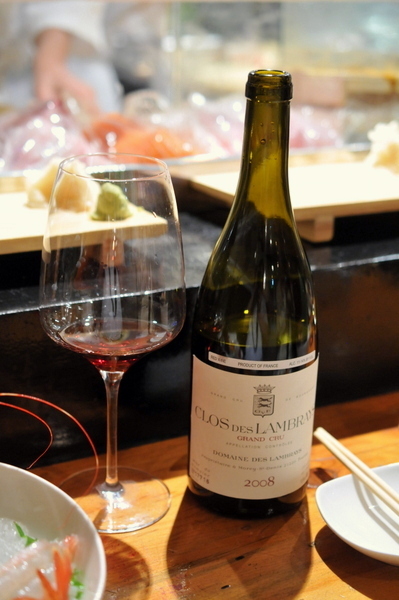 On the palate the wine has a creamy mouth feel which adds a pleasing sense of weight to the wine. 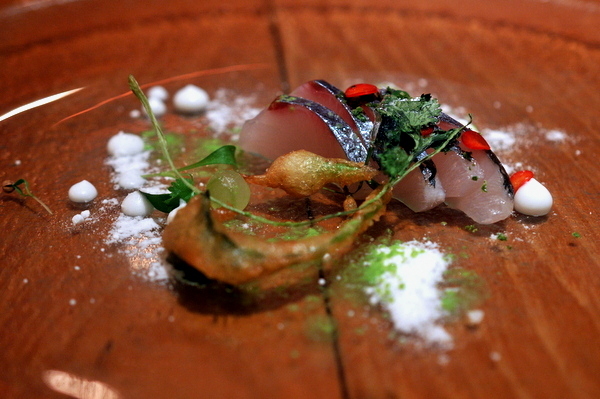 Our first course was a ceviche made from striped bass. 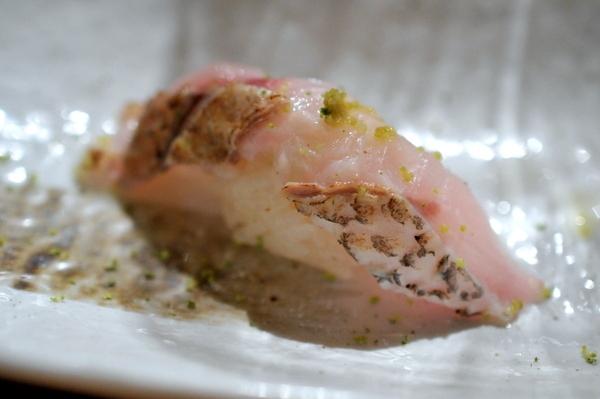 The dense fatty strips of fish were seasoned in a more subdued marinade than most ceviches. 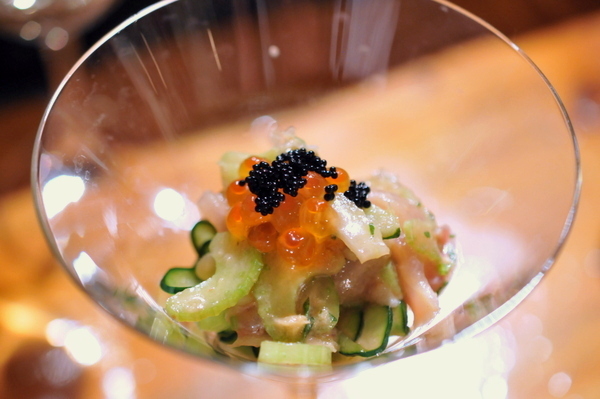 The ikura and caviar give the fish some salinity while the celery and cucumber add a crisp vegetal levity to counter the heft of the bass. 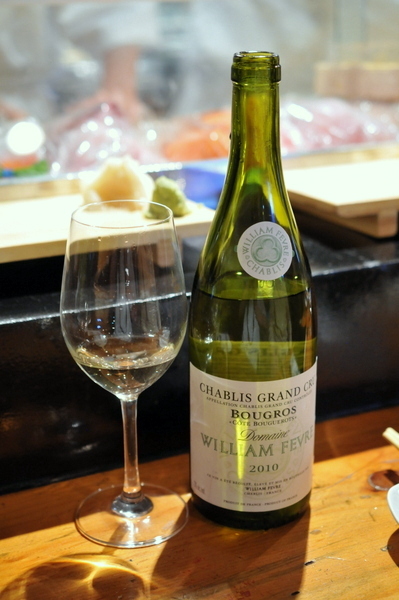 Our second wine was another Chablis, more subdued that the first with a clean minerality and light notes of green fruit and floral aromatics with lively a high-toned acidity. Next we were each presented with individual bowls of shellfish. 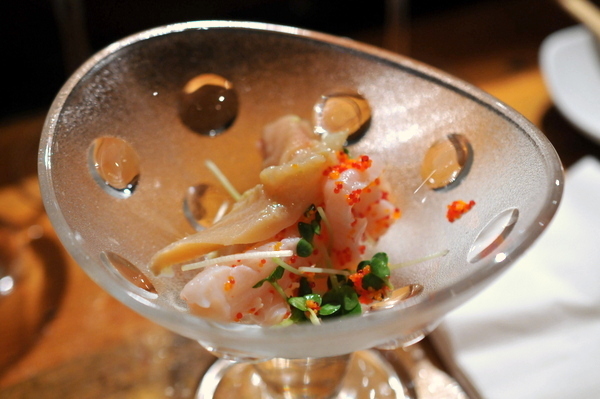 I started with the sweet shrimp, dense and crunchy with just a hint of steeliness, the sashimi came seasoned with a bit of lemon and salt. Moving onto the Kumamotos, the one topped with tobiko had a pleasing tartness that highlighted the oyster's nautral characteristics. The second oyster overwhelmed by its companions, but I didn't mind since the uni was superbly sweet and creamy. 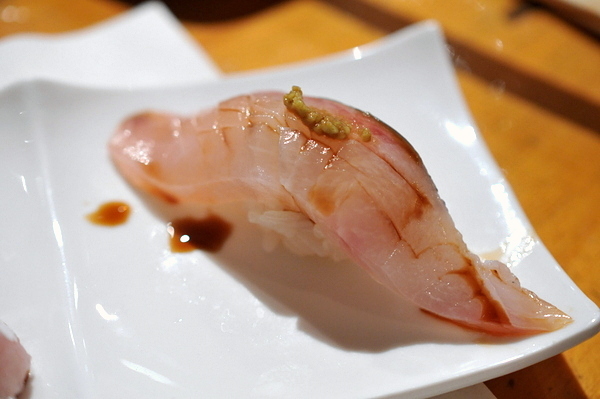 The Cherrystone proved to be my favorite of the trio, with a soft yielding texture and gentle brine complimented by a bracing bath of spicy ponzu. A fantastic young red Burgundy. 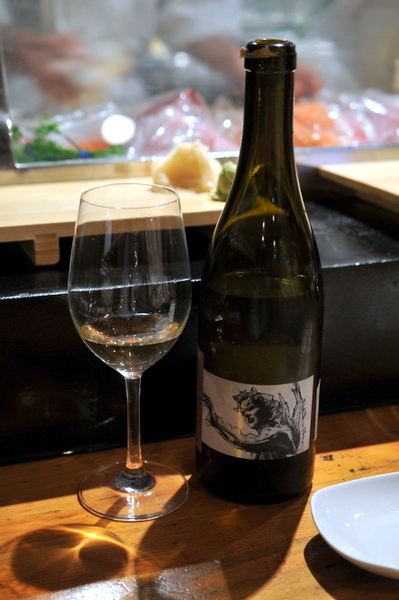 The bottle opened with intense aromas of truffle, earth, and a touch of grassiness. Flashes of red fruit were noticeable on the finish along with a hint of cherry cola with the fruit becoming more apparent as the wine opened. This was a gift from one of the other diners at the restaurant. I haven't had much luck with aged Napa Cabs but this one held up fairly well. The color was much lighter than I was used to with cab and the haze of sediment was a bit off-putting but the flavor was quite unique, savory and smoky with the barest hint of red fruit on the back end. Not really a bottle I'd enjoy drinking regularly but a very enjoyable occasional experience. The madai was a bit soft for my liking but the flavor was clean and pure, deftly highlighted by the compliments of citrus and salt. 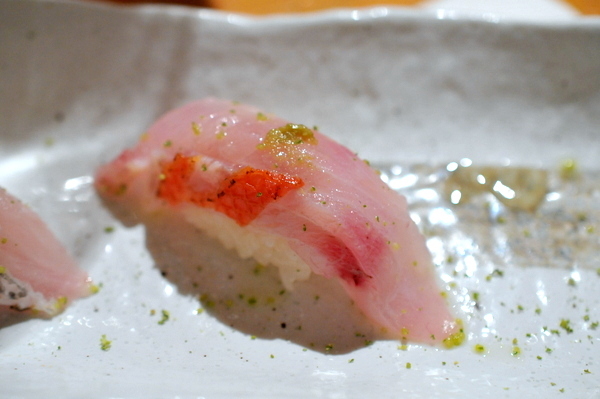 The kinmedai was noticably lusher and richer than the madai with a delightful lingering heat from the yuzu kocho. 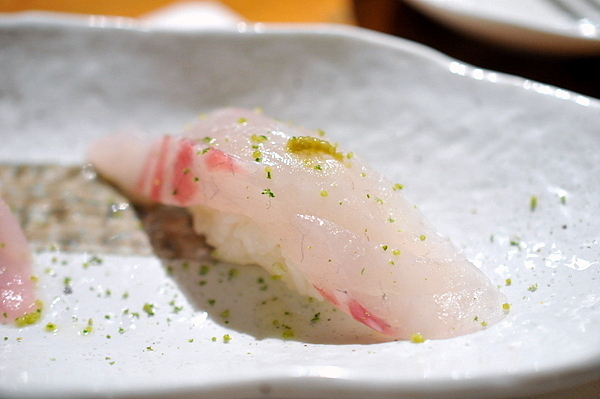 This was clearly the standout of the trio, the flash seared fish has a profound savor to compliment the fish's natural oily weight while the lemon juice was a particularly apt contrast to the richness. Switching back to more shellfish we were given several pieces of geoduck from various parts of the clam along with a couple slices of orange clam. 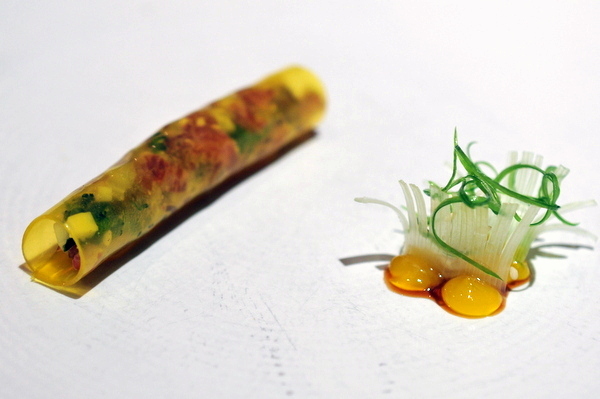 The geoduck was a pleasing study in textural contrast while the orange clam was one of the milder presentations that I've had. 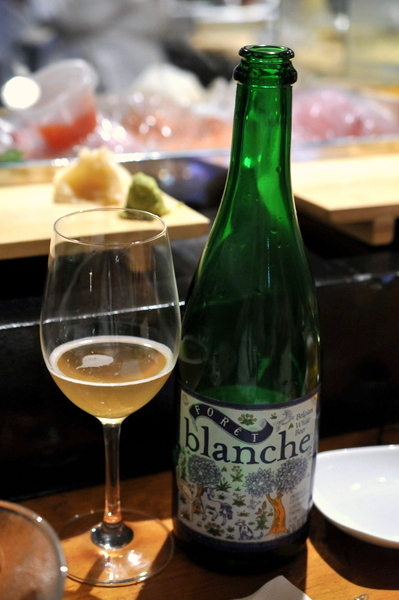 A witbeer by Brasserie Dupont in Belgium, the Foret Blanche has an intense skunkiness to start that fades quickly leaving behind aromas of lemon zest and coriander tinged with fresh grass. On the palate the beer performs similarly with malty sweetness and subtle notes of citrus and a light clean finish. 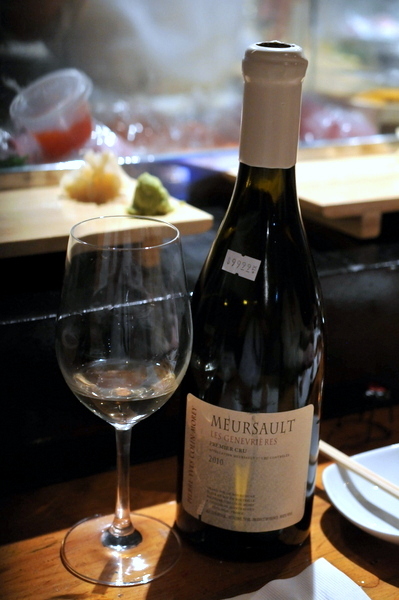 Of our three bottles of chardonnay, I enjoyed the Meursault the best. A bit richer and fuller in body than the two Chablis, there are plenty of floral and citrus tones tinged with a touch of toast and oak, there is plenty of fresh acidity and a lingering finish of lemon zest. 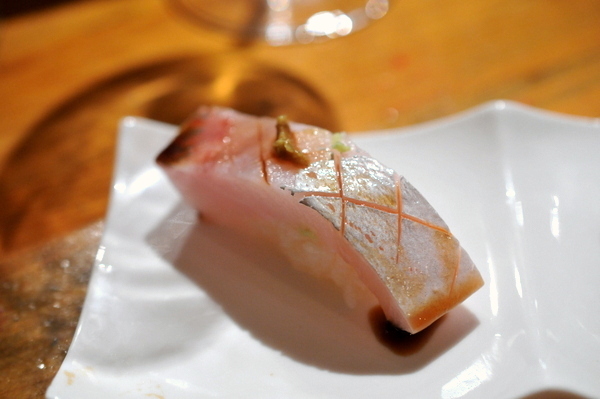 Surprisingly the Kampachi outshone the Shima Aji. 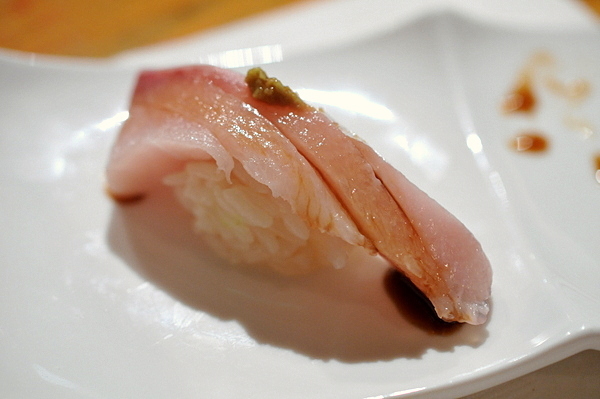 The texture is almost crunchy to start but quickly takes on a creamy consistency as the fish warms. Likewise the flavor also seemed to develop with the oils becoming more apparent upon mastication. 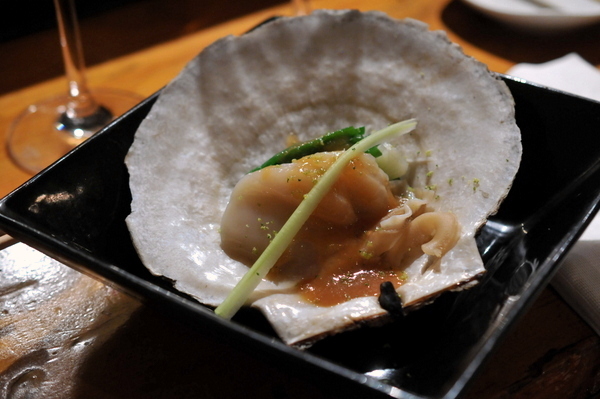 The live scallop was everything one would expect, dense and meaty with a fantastic shellfish sweetness. The white miso sauce was a bit heavy handed for the scallop but I thought it went beautifully with the scallions underneath. 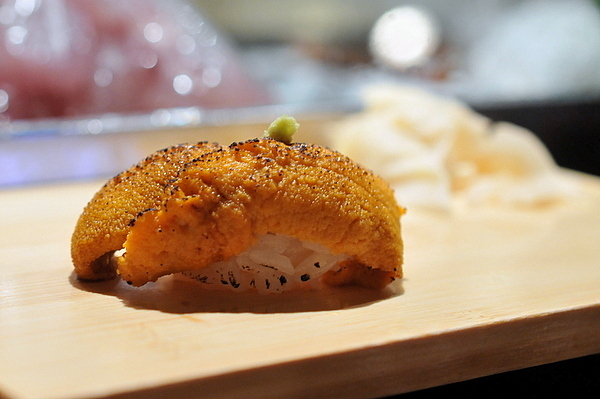 Next up, Ken seared up some more of that sublime Santa Barbara uni we had earlier in the meal. In addition to adding a savory heft, the smoky char coupled with the roe's inherent sweetness adds something of a caramelized feel to the piece. 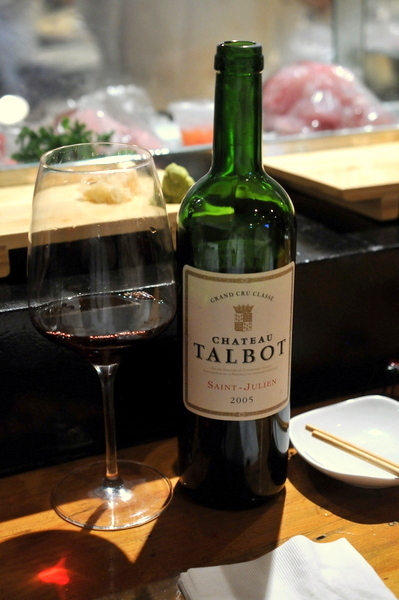 Our final wine of the night was a 2005 Chateau Talbot. 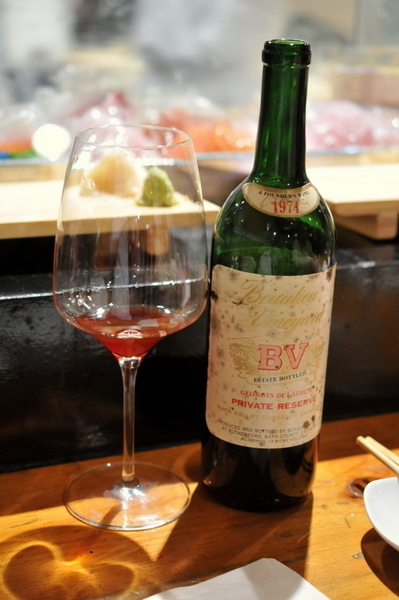 A classic Bordeaux, the still rather youthful wine showed off tobacco and earth coiled around red fruit and a hint of herbs. All in all an enjoyable wine though a bit thin on the palate. Now we are getting to the real reason I came. 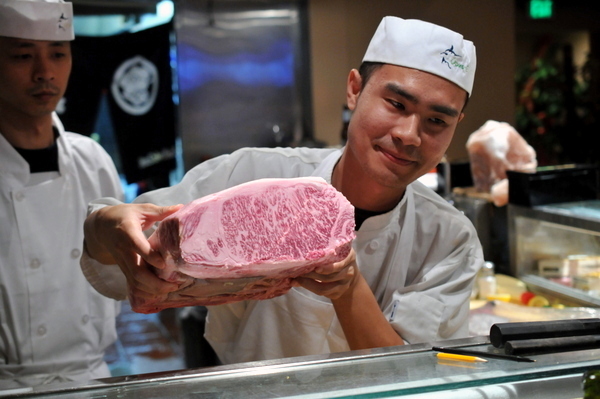 Ken proceeded to unwrap a 15lb slab of Miyazaki beef. 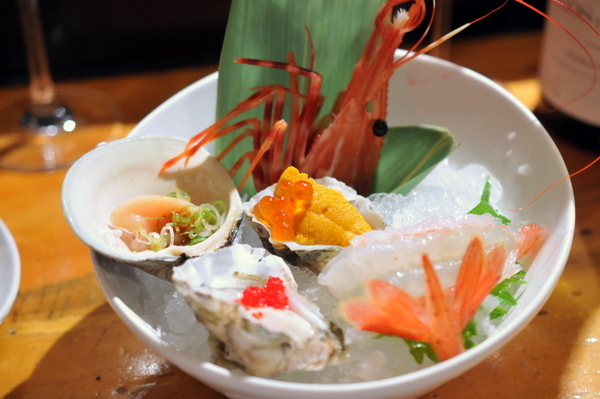 The sashimi would be the first of two presentations. While I loved the way the beef melted in my mouth I thought the flavor was a bit unbalanced with the spicy bite of the raw garlic overpowering the natural flavor of the beef. 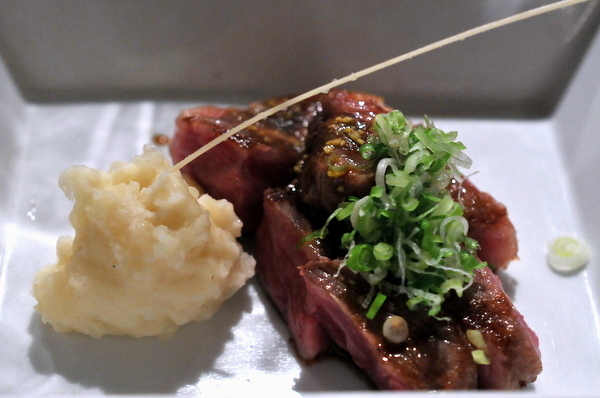 Even more than the Wagyu which one can find fairly easily, I came for the Kamatoro. 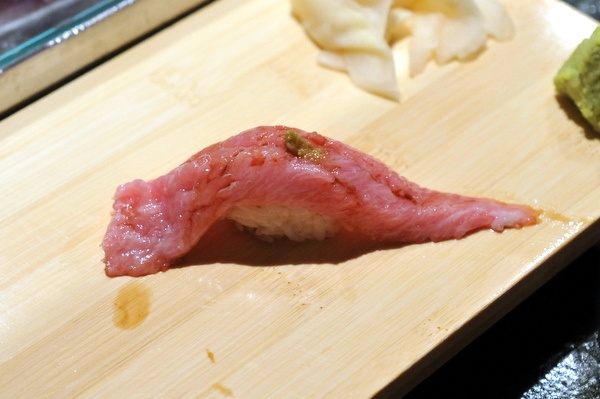 Every bit as fatty as the more well known tuna belly, the Kamatoro has a more complex texture that is at once muscular yet lissome. After finishing the treat I was haunted by a lingering oily smack that left me wanting another piece. Though I typically prefer my beef the rarer the better, I thought the light sear made things so much better. 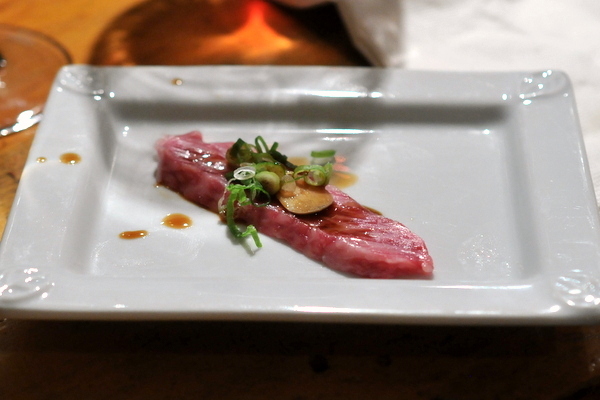 The flavor of the beef was much more prominent than with the sashimi and more than enough to stand up to the dressing. For our final course Ken cut off a chunk of the tuna collar and broiled it. Not quite as nuanced or elegant as the nigiri we'd just eaten, the collar was so smokey and fatty that it felt more like a red meat than fish. Digging the meat out of the collar was a bit difficult at times but the reward was well worth it. 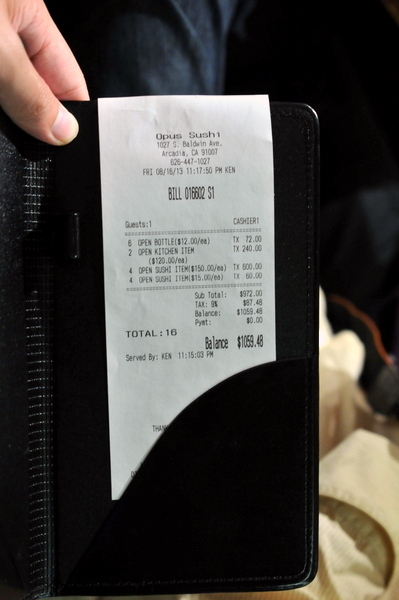 Even though my friend Charlie vouched for this place I wasn't sure what to expect, but I have to say that I was quite pleased with my meal at Opus. 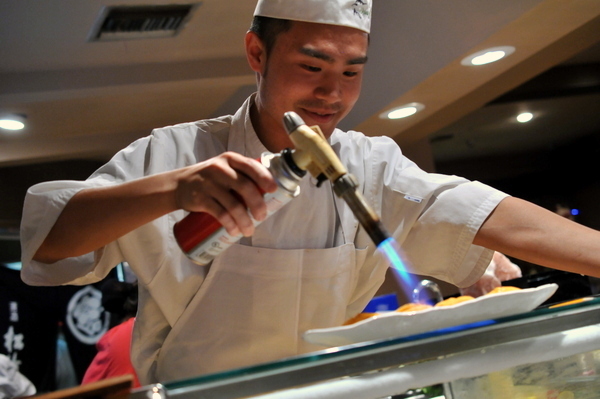 Ken clearly takes his work seriously and has an eye for picking out quality seafood.